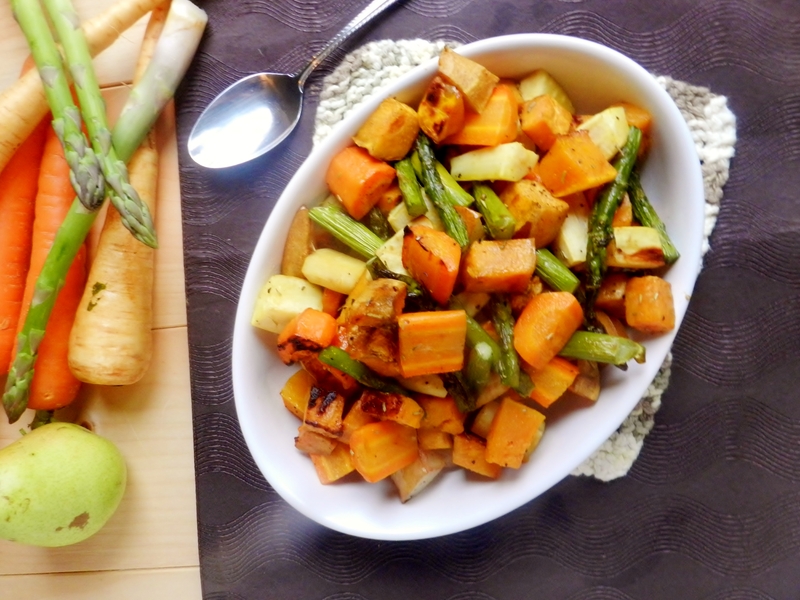 During the summer and spring months, generally our cravings lean more towards the lighter and brighter side of things, for things like salads, burgers, and anything grilled. 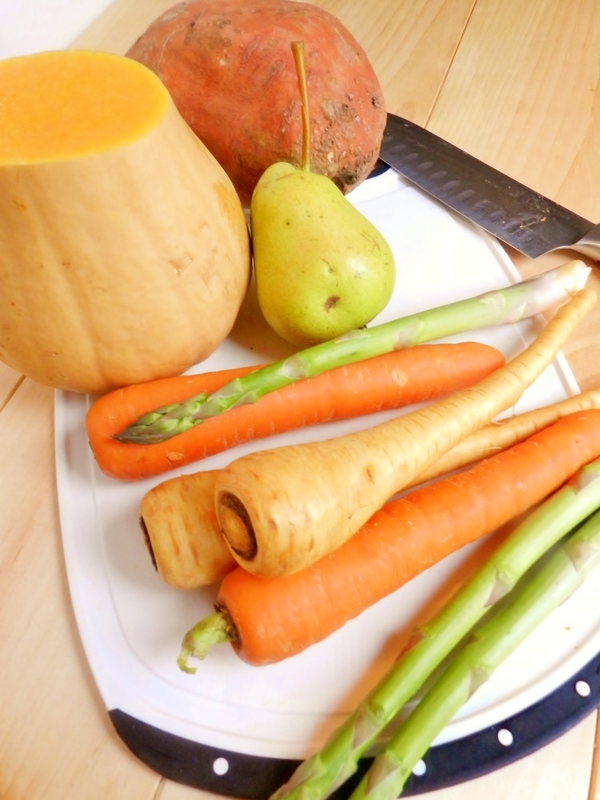 When September hits and the fall weather starts kicking in, however, we start moving towards warm soups, oatmeal, everything pumpkin and of course all of those lovely fall vegetables! 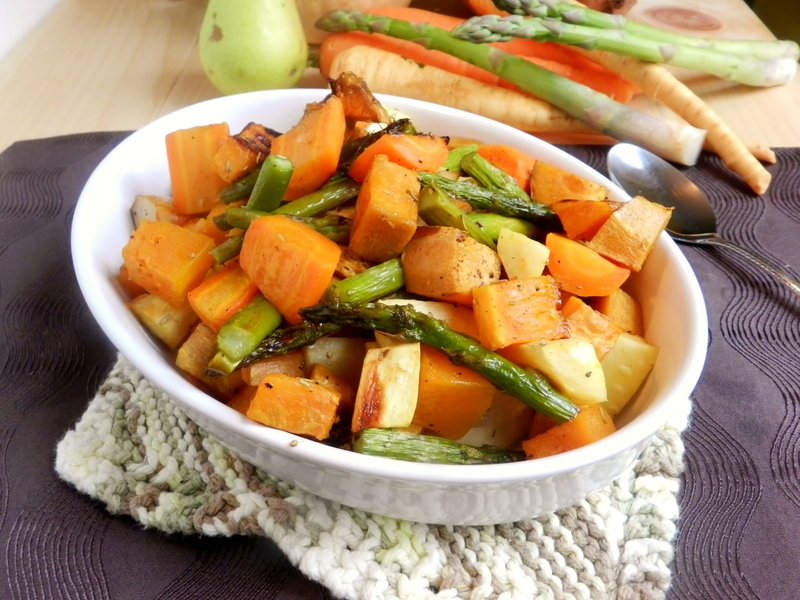 Butternut squash, sweet potatoes, carrots, parsnips, asparagus and pears! Ok so pears aren’t a vegetable, but they’re a fall fruit, and who’s counting anyways? We currently have a tonne of pears in our house right now, because not only are they way cheaper than apples (the poor apple crop!) but also, our Dad’s house in Grimsby used to be a fruit farm a long time ago, so we’ve still got a bunch of pear trees kicking around. They’re actually amazing, we literally do nothing to them, and they grow beautiful, yummy tasting pears every year! Soooooo delicious! It was exactly what we were hoping it would be. And the best part is, is it was super easy! Literally you chop, toss, roast, eat. What’s better than that? Throw in some onion and toss it all in a little olive oil, salt, pepper and rosemary, and you are golden my friends! It’s the perfect fall dish. It takes about 45min to roast, but it’s well worth the wait, and during that time you can prepare the rest of your meal, do homework, do a mini at-home workout, clean your room…. the possibilities are endless! We ate this as a main dish with some feta cheese crumbled on top and corn bread+almond butter on the side, but we both agreed that this would be fantastic as a side dish at your Thanksgiving turkey dinner, or just a regular meal at home! 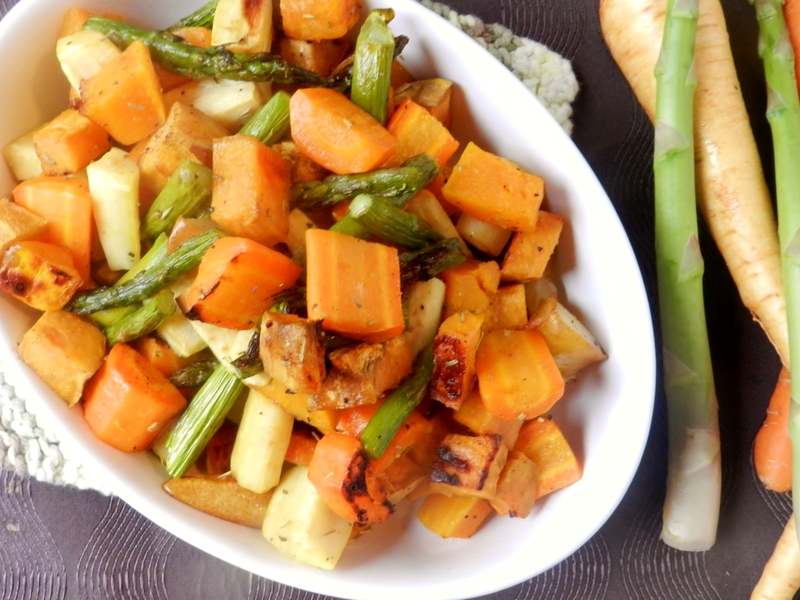 Chop all vegetables into bite-sized pieces. Drizzle with olive oil and sprinkle on the rosemary, salt and pepper. Toss until evenly coated. Bake in the oven for 40-45min, or until a fork can be easy inserted (the carrots will remain firmer than the rest of the vegetables). Sprinkle with feta or other cheese, if desired, and enjoy! What dish do you crave the most when the fall weather comes around? 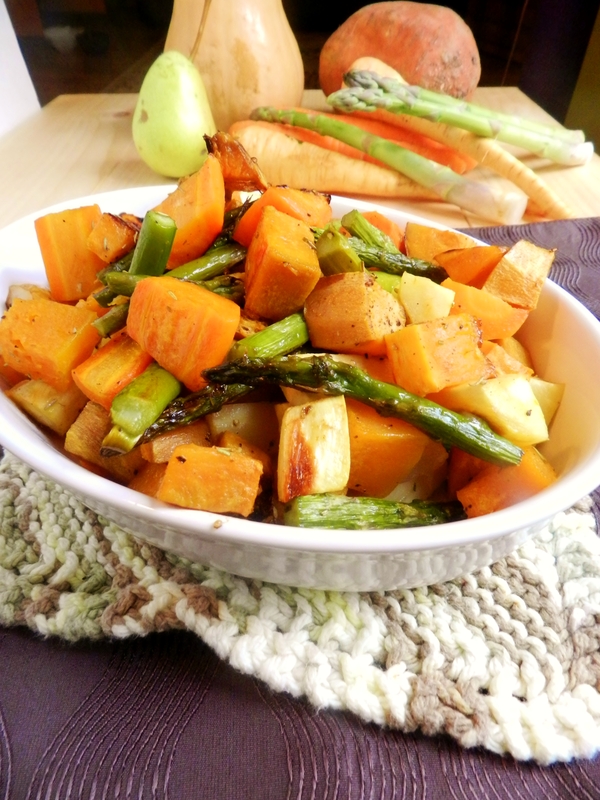 Posted in Uncategorized and tagged asparagus, carrots, easy, healthy, parsnip, pear, raosted vegetable, rosemary, salad, squash, sweet potato, thanks giving side dish. Bookmark the permalink. I think I’m about to have a very similar looking salad for dinner! Great idea using the pear here. 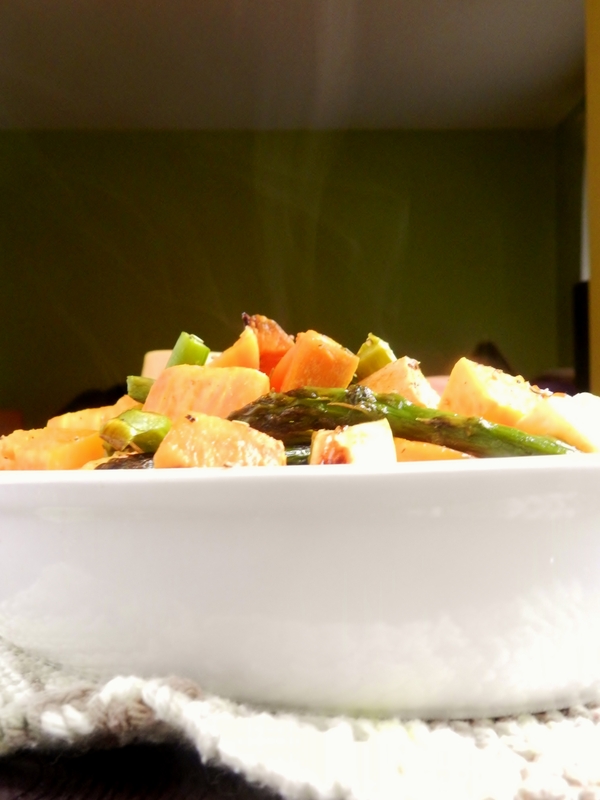 I love the sweet with winter squashes. Thanks! 🙂 Sounds like a tasty dinner!